Given enough room period, Tangs are fine to mix with cnidarians. Seriatopora caliendrum Ehrenberg 1834. 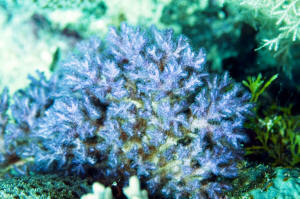 Bird's Nest Coral. I was at my LFS the other day and I am setting up a 50 gallon aquarium and I asked him if there was a Tang that I could keep in a 50 gallon aquarium. or both if I got them when they were a size of a quarter. but sold him to a guy who has a 210 gallon tank, I thought it was best for him. I really like tangs, but since I live in a apartment I am rather limited in my size of tank. Do you think there are any Tangs that I could get? First time questioner, long time reader! Quick question for you. I have a 20 month old system that is well stocked both in coral and fish. Typical mixed reef system with softies, LPS, and SPS on about 125 pounds of live rock. Sump with mechanical filtration provided by a filter sock, skimming provided by an Eshopps PSK-150, and a Phosban reactor. Maintenance is typically 30 gallons of water replaced every 10 days. and a powder brown tang. My question is in regard to the concepts of minimum tank size and fish of the tang variety. I have researched WWM extensively and I found a few posts by Mr. Fenner in regard to the width of the tank being much more concerning in terms of fish comfortably than the depth. The issue of tank length however was not discussed. My tank is a 36"x36"x27" deep dimension cube with a total volume of 150 gallons considering sump and displacement due to sand/rock. My thoughts on this is that the tank offers a circumference to swim around the tank from the bottom of the front corner to the top of the opposite back corner of over 10 feet. Fish in many long tanks are often viewed swimming back and forth, where as in my deep dimension system, they are often observed swimming around the perimeter of the tank and seldom just back and forth. Is this a good comparison in regard to the often anecdotal information of minimum tank length for fish of the tang variety or am I missing something? however all my pods, plants and algae did survive! I am going to keep an eye out and in the future see if I can "catch" one if they show up again. In the meantime I have an established yellow tang in my 90 gallon. I will be upgrading within the next year to a larger aquarium. Size will no longer be a problem!! Is there any minimum tank size that you would recommend to allow me to keep my yellow tang and add an Atlantic blue tang with no scuffles? Or would you recommend never having the two together. Also - this may be a very simple and uninformed question (as most of my rock is stackable) however - I did read on your website than when creating "bommies" it is possible to drill your live rock and peg it. What do you peg it with? I bought a 55 gallon fish tank a little over a week ago. I bought the whole set up from a man who had a 20 gallon refugium with gravity feed hose and a protein skimmer (not sure on the name) My test kits are kind of old so I have been taking the water to the LFS to be tested and every time (3x's) it has been fine. As far as aggression goes they are all fine. The Blue Tang hides often and the other two let her. Though I know I will need to upgrade to a 150 gal or larger in the future or re-home one of the Tangs, for now they seem to be doing fine. The problem I have seen is with the Blue Tang. I have seen whitish circular spots on her and her belly is looked swollen. She has also been scratching A LOT and so my hunt for a cause and cure started. I have been reading up on your site for 2 days now and it sounds like monogenetic Trematodes though I have been overwhelmed by the amount of information out there. She swims oddly (no other way to really say that) spends most of her time hiding or at the top of the tank (often face down). She has been eating and seems happy enough so that's a plus. I need help in how best to treat this. Am I off base in any way? Please point me in the right direction. Thank you for your time. My nephew lives along the Texas coast and he went to a shell shop and bought me some coral - it is not the common type that washes up on the beach down there - which the common coral looks like long fingers - this is white and very heavy and has more flat type of "fingers", can I soak this and put this in my 55 gal salt water tank? He also bought me a shell assortment of conchs and scallops what do you think about these?